Ok, this is the last time, here are some more Happy New Year labels on an ML-3000 template. From all of us at MacoLabels.com, have a happy, healthy, and fulfilling 2010. Sad to see 2009 go, but I think 2010 will be better than 2009. It pretty much has to. So here’s another Happy new year label. Ok, the holidays are great and everything, it’s exhausting isn’t’ it? We all should get at least 3 weeks off for the holidays. I can’t stop yawning. That’s all I’ve got. :|. Save money by printing your own Business cards. Try cnet, it’s a great site for many things including reviews. There are so many options, you have to consider; price, performance, operational costs, (TOC Total Cost of Ownership), and quality, and cnet.com is a fantastic resource to help you choose. Maybe you have a big function, where a lot of people are mixing about. They’ll be breaking down into groups for discussion on whatever. I’m terrible with peoples names, and I know a lot of you out there are too. What better way to help people out with learning other peoples names that to use a name tag. Can you print an image of a certificate you’d like to print with a mail merge? Yes, it’s possible. When you insert the picture, make sure that the picture is formatted as behind the text. To do this, make sure the graphic is selected, then Click on the “Format” tab, then click “Picture Tools”. Click on the “Position” icon. Click on “More Layout Options”. Select the “Text Wrapping” tab. Select “Behind text”. Next click on the “Picture Position” tab, and select the Absolute position radio button, and choose Page from the “to the right of” drop down menu. Do this for both the “Horizontal” and “Vertical” picture position. Now just insert your merge field, and you’re done. If you’ve been using MS Excel as a database for addresses to be merged with a primary document in Microsoft Word, and you have Microsoft Access, you’re missing out on a lot of functionality of Access. While Excel has become very close to becoming a database, it’s just plain easier to use a database program like Access to manipulate databases. Doing selects by state or by zipcode is so much easier in Access. But you don’t even need Word to do a mail merge if you have Access. 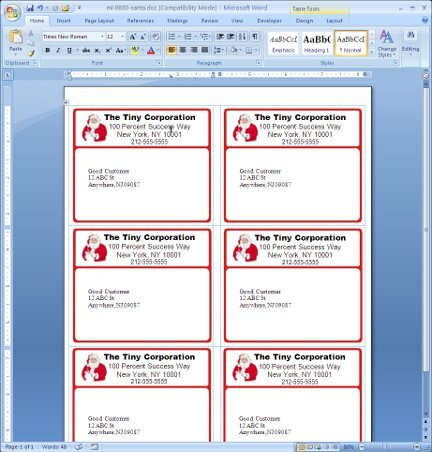 You simply create a report for your address labels. Here’s a database I whipped up from a randomized list. You’ll have to fiddle with it because once you change printers, you have to change the page setup settings. The holiday season is almost over. Ship your presents with Santa. You can use these labels on your ML-0600. They’re compatible with Avery ® 5164 labels. You are currently browsing the Macolabels's Blog blog archives for December, 2009.